Biotinylated Human Her2, His Tag, Avi Tag (HE2-H82E2) is expressed from human 293 cells (HEK293). It contains AA Thr 23 - Thr 652 (Accession # P04626-1). This protein carries a polyhistidine tag at the C-terminus, followed by an Avi tag. The protein has a calculated MW of 73.0 kDa. The protein migrates as 85-95 KDa under reducing (R) condition (SDS-PAGE) due to glycosylation. 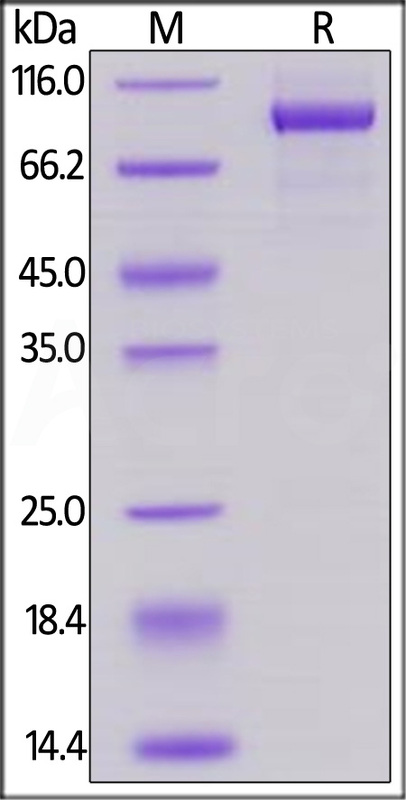 Biotinylated Human Her2, His Tag, Avi Tag on SDS-PAGE under reducing (R) condition. The gel was stained overnight with Coomassie Blue. The purity of the protein is greater than 90%. 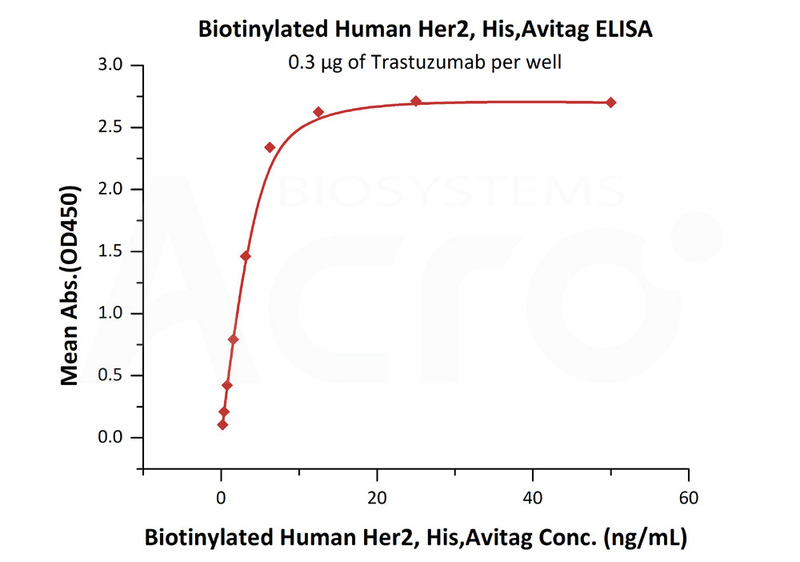 Immobilized Trastuzumab at 3 μg/mL (100 μL/well) can bind Biotinylated Human Her2, His Tag, Avi Tag (Cat. No. HE2-H82E2) with a linear range of 0.2-6 ng/mL (QC tested). Human Epidermal growth factor Receptor 2 (HER2),also called ERBB2, HER-2,HER-2/neu, NEU, NGL,TKR1 and c-erb B2,and is a protein giving higher aggressiveness in breast cancers. It is a member of the ErbB protein family, more commonly known as the epidermal growth factor receptor family. HER2 is a cell membrane surface-bound receptor tyrosine kinase and is normally involved in the signal transduction pathways leading to cell growth and differentiation. HER2 is thought to be an orphan receptor, with none of the EGF family of ligands able to activate it. Approximately 30% of breast cancers have an amplification of the HER2 gene or overexpression of its protein product. Overexpression of this receptor in breast cancer is associated with increased disease recurrence and worse prognosis. HER2 appears to play roles in development, cancer,communication at the neuromuscular junction andregulation of cell growth and differentiation.